''They are nationalists, fascists. No one wants to hear it, but it's true." ~ Kyaw Kyaw, lead singer of Rebel Riot. When nobody else will speak out against an apparent wrong there is always someone that will do something out of the ordinary. Crossing the lines that we in society draw between what we know is right and what we will actually do to stop evil, this individual is the misfit. They trample upon the status quo without regard for their own image. Standing up for what they know is right, this one person refuses to follow societies lead. In the West these people, the ones that rock the boat, are often referred to as punks. In the 80's this rebellious spirit was harnessed by a musical movement that would give punks their fashion. Spikes, leather, studs, and chains all replaced the soft resistance to conformity that had followed the 60's and 70's. Like a fire, the spirit of the punk movement burnt away that which held us to a system that robbed us of everything that made us unique. For this desire to be free at last we turned to anarchy. 30 years later the punk is still alive within the hearts and minds of those who shrugged off the image of what society wanted them to be. Now new generations of punks replace those who came before them. The music, the fashion, the spirit is still fast, violent, and loud. "All I can really say is, people should look at the teachings of Buddha and ask themselves, is this what he meant?" This spirit of anarchy can be seen in Burma amongst a brave few. 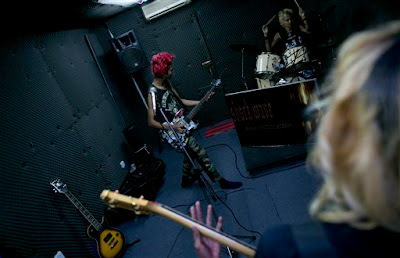 These punks live under one of the most oppressive governments the world has to offer. Their society is as tightly wound as it can possibly be with police given almost complete impunity. The military still has every right to round up any citizen at any time and simply make people disappear. Yet the punk spirit rises out of Burma like a phoenix. In a country where the national religion, Buddhism, is considered an integral part of national identity the willingness to speak out against Buddhist extremist is shocking. It is even more shocking to Burmese society when someone is willing to speak out against the most revered members of Burmese society... the monks. And that is exactly what the a handful of punk in Yangon have done. 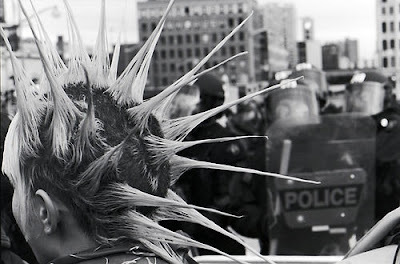 Crossing the line between society's accepted norm and over into the realm of dissent the punks choose to speak out against the monks who have spread the 969 movement. This has put the punks of Burma in the same situation American punks faced during the 80's with a resurgence of American hate groups. Yet for Burma's punks it is a stand against the oppressor, an oppressor that they very recently knew all to well, it is a fight to the death with a system that embraces the hate group while rejecting them. "No fear! No indecision! Rage against the system of the oppressors!" The main issue the punk movement faces in Burma is that there are many more 969 supporters and very few "punks". Burma after all is a traditionalist society. It has a long history of rejecting new aspects of social behavior. Conformity is king in a society where fear was the law of the land. Those who act out, those who behave differently, are considered outsiders. All the while those who would divide society so as to conquer it are treated as idols. Perhaps this is the aspect of Burma that the punk scene has highlighted most. In a country where religion is given the authority to segregate there can't really be freedom. In a country where hate is fed to the masses under the guise of love there will never really be unity. Chaos and anarchy aren't likely in the streets of a police state. But they will always reside in the hearts of disenfranchised youth as long as the government clings to the chains of previous oppressive regimes. If leaders like Aung San Suu Kyi are going to promise the everything from democracy to the moon they will find it hard to maintain the repression that has long ruled Myanmar. They will not be able to keep the influences of the free world out of their children's headphones and off the computer screens of their students. Once the images and sounds of freedom leak into the minds of the youth they become fountainheads. The tide that flows forth from this cannot be held back. It is a catalyst in societies that refuses to surrender to the will of tyrants. This desire... this, the most natural yearning of the human spirit... for liberty is alive in the hearts of the few punks in Yangon. It prompts them to speak out when no one else wants to. It is a fire that cannot be stifled by the threat of a jackboot's heel. For 969 and the nationalist in Myanmar's government it is a threat. Just as with all oppressors, liberty is seen as anarchy. For the fascists freedom is perceived as chaos. Proof of this can be seen in how the regime in Myanmar has responded to the Rohingya support (both in Burma and around the world). “I also use a laptop secretly, everybody uses a laptop secretly..."
~ Rohingya Activist in hiding. In an effort to stop the flow of information out of concentration camps in the Arakan state the Burmese government during the last week of July raided countless camps. They weren't looking for papers or letters. They weren't looking for particular individuals per say. These stormtroopers were after the new age version of Anne Frank's diary... laptops and smart phones. Like the SS looking to seal off the ghettos in Poland, Burma's military set out to confiscate electronic communications that could possibly reach foreigners. This practice fits Burma's old junta style government well. In the past the Burmese military had pushed refugees right out to the border only stopping when foreigners could see their soldiers' atrocious behavior. The confiscating of computers and laptops shows the desire to keep the outside eyes from seeing what is going on inside camps that the UN called "inhumane". It shows a desire on the part of Burma to silence the already voiceless Rohingya people. And even more sinisterly it shows a government prepping camps for liquidation. This is the government and it's actions that the punks of Yangon so boldly spoke out against. Though just two years ago they would had all been rounded up and taken to prison without question, they spoke out anyway. Even though nobody really knows where the line between the old regime's censorship and the new regimes patience is really drawn, they spoke out anyway. They spoke out against the savaging of Rohingya women and children by Myanmar's military. They spoke out against the pogrom of Rohingya villages in the name of Buddhism. They spoke out because no one else would. In a world where nobody is willing stand up to jackbooted thugs it is at very least reassuring to know that a handful of punks will. Want to learn more about the Rohingya and their plight at the hands of Burmese nationalist?